Originally this saying was a warning: a dog, even if it’s just innocently walking along, is likely to be driven off by someone with a stick. By extension, it meant that one is likely to run into unlooked-for trouble while engaged in normal activities. However, the verb 当たる is often used with positive connotations, contrasting with する (suru, written variously as 磨る, 摩る, or even 擂る, which can mean “to lose,” “to miss the mark”). So the modern meaning is completely reversed from the original. Nowadays, this kotowaza means that sooner or later, you’ll probably have a lucky break even if you weren’t especially looking for or expecting one. This one is a full sentence. We begin with 犬 (inu, “dog”) as our subject. The subject-marker particle in this case is replaced, or superseded, by the particle も (mo), operating as an intensifier (“even”). Its verb is 歩く (aruku, “to walk”) in conditional form. The following clause contains the noun 棒 (bou), meaning “stick,” “pole,” “staff” etc.) and the verb 当たる (ataru), meaning “to be hit by,” “to contact,” – and many other things, including “to be correct,” “to win a game of chance.” The particle between them is に (ni), indicating directionality or position. In this case it indicates the relationship between the dog and the stick – one meets the other. The final verb can be replaced with 会う (au, “to meet”) with little change in meaning. This is the very first entry in the Edo Iroha karuta set. 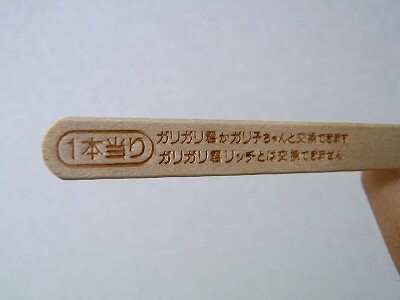 If you get 当たり, it means you get another popsicle. Hurray! This entry was posted in Japanese, Kotowaza and tagged 犬, dog, luck, stick, unexpected, 棒に当たる. Bookmark the permalink.